In size this manuscript is not untypical of Bibles that were produced in their hundreds in the 13th century; but it has several very unusual features. For example, the main text of almost all medieval Bibles was written with two columns per page, not one, as we find here. Secondly, this manuscript has a liturgical calendar and a long series of sermon notes between the Old and New Testaments. The calendar has previously been taken to indicate a Dover origin, but Christ Church, Canterbury (of which Dover priory was a cell), is more likely. It was certainly owned by Roger Bennett, a monk of Christ Church in the 15th century. The calendar is laid out with four months per page. The presence of the feast of the Dedication of St. Martin's Priory, Dover ('Dedicatio ecclesie sancti Martini de Dovor. 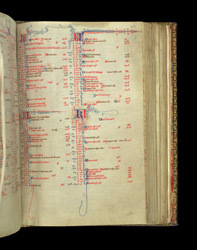 ', 19 October, lower left of page) has previously been taken to suggest an origin there; but this entry is not written in red, and has no liturgical grading, suggesting that it was a minor feast. Edmund of Abingdon, Archbishop of Canterbury, who was canonised in 1246 is absent, suggesting that the calendar was written before that date.